Not a trivia buff? It doesn't matter! 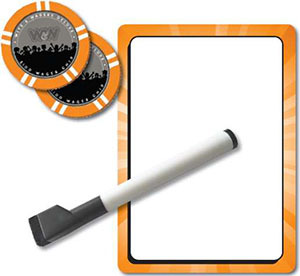 Each player writes down a guess to the same question and places it face-up on the betting mat. Feeling confident? Bet on your guess! Think a friend knows better? Bet on their guess! 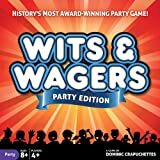 The player with the most points after 7 questions wins. 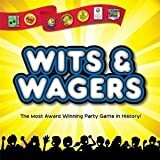 Wits & Wagers is most fun with groups of 6 or more people. We recommend playing at holiday parties, family reunions, or any large gathering of friends. Be prepared for light-hearted banter, a little bravado, and a big dose of cheering! 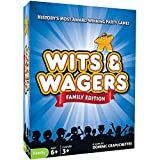 Wits & Wagers is a great team game. If you have a large group, we recommend dividing into 7 teams with 1-3 players on each team. When playing with teams, give everyone a little extra time to answer questions and place bets. Have someone volunteer to be the Banker. (This player is usually the best at keeping a balanced check book!) Stack the Cardboard Chips next to the banker. The Banker will play in the game as a normal player. Asking the Question: The Question Reader picks up the 1st Question Card from the table, announces that it is Question #1, and reads Question #1 from the card. Answering the Question: The Question Reader turns over the 30-second Sand Timer. 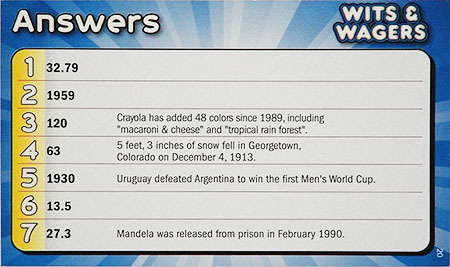 Players (or teams) have 30 seconds to write a guess on their Answer Card. Try to come as close as possible to the correct answer, without going over. The answer to every question will be a number, so you can always estimate a guess. Players may answer in whole numbers or in decimals. Questions 2 - 7: The Question Reader always reads the question that corresponds to the question number being played. For the 2nd question of the game, read Question #2 on the 2nd Question Card drawn from the box. 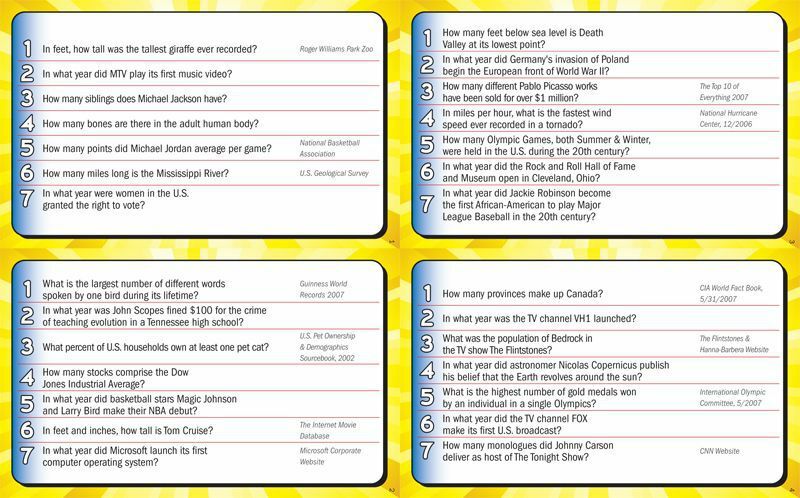 For the 7th and final question, read Question #7 on the 7th Question Card drawn from the box. When the Sand Timer runs out, place the Answer Cards face up on the Betting Mat. Arrange the guesses in increasing order, from the smallest guess to the largest guess, as directed by the arrows on the Betting Mat. If multiple players wrote the same guess, place them in the same payout slot. The middle guess goes in the "Pays 2 to 1" payout slot. The "Pays 2 to 1" payout slot is left open. The two middle guesses go in the two "Pays 3 to 1" payout slots. The Question Reader turns over the 30-second Sand Timer once the guesses have been sorted. Players (or teams) get 30 seconds to bet their two cardboard Betting Chips. The goal is to bet on the guess that is closest to the correct answer, without going over. Bet both Betting Chips on the same payout slot. Split their Betting Chips between any two payout slots. You do not have to bet on your own guess. You may only bet on a payout slot that has a guess in it, unless it is the "All Guesses Too High" slot. Moving Your Bets: During the 30-second betting period, it is OK for players to move their bets. However, players may not place a bet or move a bet after the Sand Timer has run out. Poker Chips must always be placed underneath a cardboard Betting Chip. This way the Banker will know who placed each bet. Players may place any number of Poker Chips underneath each Betting Chip. There is no limit as to how much players can bet. Players can still only place a maximum of two bets per question. Poker Chips are lost if they are bet on the wrong guess. Betting Chips are always returned, even if they are bet on the wrong guess! The Question Reader flips over the card and reads the answer. Closest Guess Without Going Over: The winning payout slot will have the guess that is closest to the correct answer, without going over. All Guesses Are Too High: If all of the guesses are higher than the correct answer, then "All Guesses Too High" is the winning payout slot. The Banker awards a bonus of 3 red poker chips to each player (or team) who wrote a guess that was placed in the winning payout slot. The Banker collects the Betting Chips that are not on the winning payout slot and returns them to the appropriate players. The Banker collects the Poker Chips that are not on the winning payout slot and returns them to the bank. 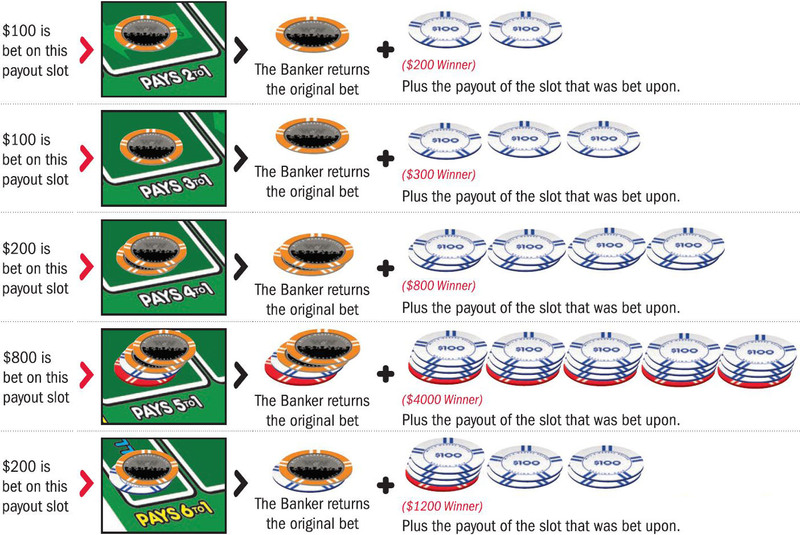 The Banker pays each player (or team) who bet on the winning payout slot. Payouts depend on the number of chips bet and the payout odds. The Banker also pays a bonus of 3 white Cardboard Chips to each player (or team) who wrote the winning guess. 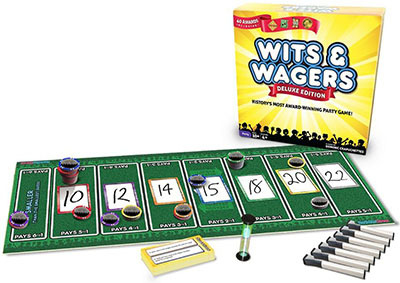 Players (or teams) take back their Wits Answer Cards. The Question Reader places the used Question Card blue-side-up next to the remaining Question Cards. For each new round, the Question Reader begins again with Step 1. The player (or team) with the most points at the end of the 7th question wins the game! In the case of a tie, the team with the youngest player wins. The Question Reader should return the 7 used Question Cards to the back of the deck. When you start a new game, draw the 7 cards from the front of the deck. This way, you won't repeat a question until you have gone through all 700 questions! On every round, there will be either an even number of unique guesses, or there will be an odd number of unique guesses. Sort these guesses from smallest to largest according to the examples below. Important note: If multiple players (or teams) write the same answer, place them in the same playout slot. Odd Number of Unique Guesses: The middle guess goes in the "Pays 2 to 1" payout slot. Even Number of Unique Guesses: The "Pays 2 to 1" payout slot is left open. Bet both Wager Chips on the same payout slot. 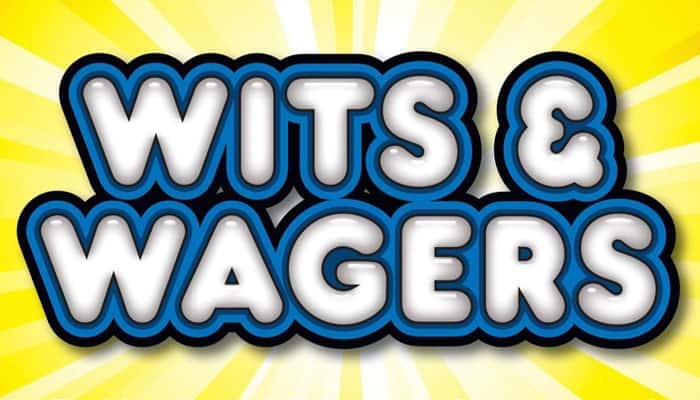 Split Wager Chips between any two payout slots. Players (or teams) do not have to bet on their own guess. Players (or teams) may only bet on a payout slot that has a guess in it, unless it is the "Smaller than the smallest guess" slot. During the 30-second betting period, it is OK for players to move their bets. However, players may not place a bet or move a bet after the Sand Timer has run out. Cardboard Chips must always be stacked underneath a Wager Chip. This way the Banker will know who placed each bet. Players (or teams) may stack any number of Cardboard Chips underneath each Wager Chip. There is no limit as to how much players can bet. However, players can still only place a maximum of two bets per question. White Cardboard Chips are worth $100 Gust like a Wager Chip). Red Cardboard Chips are worth $500. Black Cardboard Chips are worth $2500. If Cardboard Chips are bet on the wrong guess, they are lost and returned to the bank. The Wager Chips are returned to the player (or team) to be used for the next round. Players (or teams) are not obligated to bet with Cardboard Chips. The winning guess is always the closest guess to the actual answer, without going over. If the actual answer is 2008, then "2004" would be the winning guess. ("2004" is the closest without going over the answer). Players (or teams) that place a bet on the winning payout slot will win Cardboard Chips - even if the winning slot does not contain their answer!